Spend Matters has revealed the 50 Providers to Know for 2019. Each year the 50 Providers to Know list recognizes the best-in-class companies in the procurement and supply chain market. These are firms you need to know; they lead the charge on new procurement technologies and services, setting the industry standard. Vendors listed are independently selected by the analyst team over multiple rounds of debate, focusing on factors such as innovation, market presence, tech competency, and solution delivery. Where applicable, providers go through the rigorous SolutionMap evaluation process. This marks the sixth year of publication for the Spend Matters 50 to Know as well as its counterpart, the 50 to Watch. Market shifts including M&A have led to widespread changes, including seven companies who have made the leap from 50 to Watch to 50 to Know: APEX Analytix, Corcentric, SirionLabs, Sovos, State of Flux, Upwork, and Wax Digital. Also deserving mention are newcomers in the consulting space such as Everest Group and Shelby Group. How are the 50 Providers to Know Chosen? 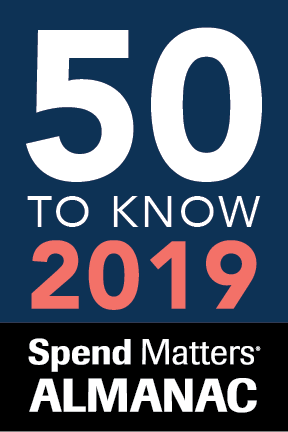 The Spend Matters annual 50 Providers to Know and 50 Providers to Watch lists are determined by the entire Spend Matters analyst team to represent the best of the commercial providers that serve enterprise-level procurement organizations. The 50 to Know list comprises industry-leading proven providers and the 50 to Watch list contains often lesser known providers of which practitioners ought to be aware. Developing the lists is not an exact science, but there are guidelines we use to construct these lists of vendors amongst the hundreds of firms in the marketplace. To ensure consideration for your company, we encourage you to create a listing in the Spend Matters Almanac and go through the SolutionMap vetting process. View the full selection methodology. The Almanac is a vendor intelligence directory for modern procurement covering more than 25 categories and serves as a resource for anyone interested in an unbiased view of the procurement service provider landscape. Visit spendmatters.com/almanac to learn more about the providers featured on this list or to add a listing for free.